More on soy? Oh joy!! Home » hot flash » More on soy? Oh joy!! A close friend of mine wrote me the other day to tell me about an article she had seen. In it, the author claims that using soy sauce will help to alleviate hot flashes. However, the author neither backs this claim with any evidence or provides information on how much soy sauce you’d need to obtain the minimal level typically associated with some sort of reduction in menopausal symptoms. Because there’s a ton of bad information floating around the interwebz, I wanted to break it down for you, right here and now. I also encourage you to peruse the archives because I’ve written a ton of posts on soy isoflavones. 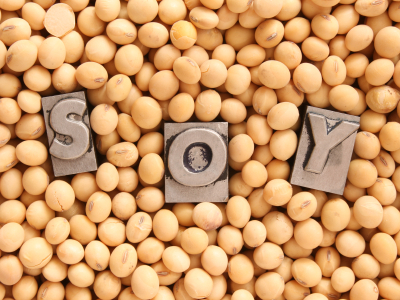 Soy isoflavones are plant-based compounds that are believed to mimic the action of natural estrogen in the body. Therefore, researchers have been dissecting and studying the properties of soy for years in order to determine if this alternative to hormone replacement can help alleviate hot flashes and night sweats, and possibly even promote bone health in menopausal women. The deeper researchers delve into the properties of soy, the more they are learning. For example, the ratio of the most plentiful soy isoflavones, i.e. daidzein and gensistein, are important, and a metabolite of daidzein called S-equol appears to be the most potent in terms of preventing flashes and sweats. S-equol is produced in the gastrointestinal tract however the ability to actually manufacture it depends on the presence of certain microflora. Consequently, only 30% to 60% of individuals are actually able to produce S-equol on their own (although this figure is believed to be higher among Asians and vegetarians). Studies that have examined the role of a soy-based diet, mostly among Asian populations, typically focus on four main foods that are rich sources of soy isoflavones: tofu, miso (fermented soybean paste), natto (sticky, fermented soy food rich in vegetable protein) and fried tofu. Soy sauce and soy oil do not contain isoflavones! Therefore, using either in cooking will not prevent hot flashes or night sweats. In a more recent review of soy products published in the American Journal of Epidemiology, researchers evaluated the dietary habits of 1,106 Japanese women between the ages of 35 and 64 over six years to determine a possible association with hot flashes or lack thereof. All participants were asked to record what they were eating as well as the serving size; included were nine specific soy products (miso soup, tofu, deep-fried tofu, fried bean curd, dried bean curd, natto, houba miso, soy milk and boiled soybeans). The findings? There was an inverse association between eating soy and hot flashes – those women eating the greatest amount of soy, i.e. 115.9 grams/day, that contained the greatest amount of isoflavones, i.e. 50.8 grams/day, had the highest amount of protection against developing hot flashes and a 6% lower risk than women who consumed the least amount for developing hot flashes over the course of the study. Moreover, the results were upheld even after researchers accounted for factors such as age, menopausal status and total daily caloric intake. Notably, if soy sauce or oil actually contained isoflavones, an individual would have to consume at least 4 ounces of soy sauce daily to obtain any benefit. Most importantly, when it comes to soy, even supplements aren’t created equal. If you are going to go that route, speak to a licensed practitioner who specializes in herbal medicine and look for a supplement that notes standardized manufacturing on its label. Simply walking into a drugstore to make a purchase is a sure way to guarantee that skimping on price often means skimping on quality. There’s a lot more we need to learn about soy before making blanket recommendations. Soy is more complex than researchers originally thought. And a few drops a day? No way! This is great info. My preference of all mentioned is edamame (boiled Soybeans). Better start eating more today! Thanks Kim! I’m glad that it was helpful.